16 teams from 9 countries came together for the 19th annual International Snow Sculpture Championships which was held in Breckenridge, Colorado from January 20-25, 2009. These artists carved 20-ton, 12-foot tall blocks of snow into the most intricate, astonishing snow sculptures the world has ever seen. For several years this wintertime event remained on a small scale, bringing everyone from merchants to school children into the fold of snow sculpting. However, in the late 1980s, the event broadened to a state-wide competition. 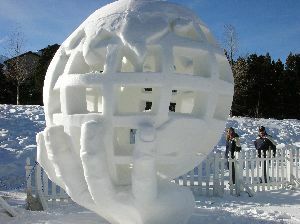 And in 1991 Breckenridge hosted the first International Snow Sculpture Championships. Since its inception, the event has fostered a spirit of world-wide artistic camaraderie, bringing together cultures as diverse as Russia, China, Japan, Morocco, Belize, Finland, France, New Zealand, Switzerland, Sweden, Mexico, Wales, and Canada just to name a few. Language barriers are broken down; political differences are set aside and the result: art, pure and simple. Each 4 person team carves unique sculptures, oftentimes depicting cultural influences, proud heritages and aspirations of those whose skill are involved. Only hand tools are allowed in the competition; no power tools may be used. The Breckenridge Ski resort makes the snow. The snow is blown into blocks by a huge snow blower. The man-made snow provides the same consistency throughout the block. Each block weighs about 22 tons, and measure 10 feet wide by 10 feet high by 12 feet tall. Team Canada, Yukon captured 1st place in the 2009 International Snow Sculpture Championships with their entry: "Family Reunion". Second place and the Artist's Choice Award went to the Team China for their artwork entitled "The March of Spring". Finishing in third place was Team USA, Wyoming with "Trunks Optional". All photos were taken by Joe R. with a Nikon D40x DSLR, except those which are labeled as taken by Joe A. with his Nikon Coolpix 4100. Breckenridge, Colorado is located approximately 80 miles southwest of Denver in the heart of the Rocky Mountains. At an elevation of 9,603 feet, it has a year-round population of 2,803, with a peak population of 34,886 (during ski seasons). Breckenridge has been a thriving town since 1859. It is the oldest continually-occupied community in the Colorado mountains. It is lined with hundreds of 19th-century buildings that have withstood the 20th-century test of time. It has an eclectic array of restaurants, shops, galleries and clubs which provide the perfect compliment to the abundant outdoor recreation. A community steeped in tradition, culture, festivals and a sense of place. Breckenridge sits in the Rocky Mountains' most beautiful alpine valley and has the world's bluest skies. It remains a genuine town with a remarkable Gold Rush history.